Forbesjust released its annual ranking of the world's richest people and, to a few readers, the list may come as a shock. The top slot isn't taken up by its perennial inhabitants Bill Gates or Warren Buffett; in fact, for the first time since 1997, it isn't held by an American. This year's top tycoon is Mexico's Carlos Slim Helú. 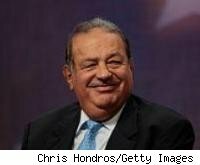 Slim, who has made his fortune from telecom holdings in Mexico and Latin America and investments in U.S.-based companies, including The New York Times (NYT), is no stranger to Forbes's annual list. He has spent the last five years among the top five members of the world's most exclusive club. In fact, this isn't even the first time that he has been identified as the world's richest man: for a brief period in 2007, he pulled ahead of both Buffett and Gates to grab the top slot. That year, Forbes identified him as the world's third richest man. In 2008, he again moved past the Master of Microsoft to grab the number two slot on Forbes's list. Admittedly, Slim's current standing puts him ahead by a nose, at least in billionaire terms. While Gates's holdings are currently worth $53 billion, Slim's holdings are valued at $53.5 billion. The son of a Lebanese-born dry goods salesman ("Slim" is adapted from "Selim"), Slim studied engineering at the Universidad Nacional Autonoma de Mexico. After playing around in the stock market, he purchased a soda company and a printing company, followed by a tobacco company in 1981. This, in turn, led to a buying spree in the early eighties. Over the years, a combination of rising values and almost preternaturally wise investing has transformed him into Mexico's most powerful mogul. According to the Wall Street Journal, Slim is responsible for approximately 7% of Mexico's annual economic output. Although his companies are involved in everything from airlines to soft drinks to bicycles, the jewel in his crown is Telmex (TII). Through it, he controls 92% of all landlines in Mexico, as well as 73% of all cell phones. Although Slim has increasingly opened up to the press, he still is considerably reticent and touchy when it comes to discussing key aspects of his business. When reporters have written unflattering accounts about him, he has allegedly threatened to withdraw advertising from their papers. He has even become a part-owner in some publications after they printed critical reports about him. His critics, however, acknowledge that Slim, "despite all his faults, doesn't appear that bad." Slim has made his fortune by buying ailing companies, fixing them up, and turning them into monopolies. He has claimed that his close friend, futurist Alvin Toffler, has had a distinct influence on his investment strategy. For the past 30 years, Toffler has argued that the world is entering a "third wave" post-industrial society, in which the flow of information is key for the production of money. That might explain why Slim has pursued investments, including Telmex, that have given him a stranglehold on the pipeline of electronic information flowing through Mexico. The connection between Toffler's predictions and Slim's investments is hardly accidental: When the two first met in 1993, Slim was carrying a well-thumbed, heavily-annotated copy of one of Toffler's books. As for his own future, Slim continues his close involvement with the Times, and (oddly enough) has expressed interest in buying a second-tier soccer team in Queens, N.Y.